Well, here we are just ten days shy of the end of the 2011 WordCount Blogathon and I have to say that it’s been a blast! My blog has grown so much, I’ve met some wonderful fellow bloggers, and had a bunch of terrific guests share their insight here. Today, as part of the Blogathon, I’ve been tasked with writing on a theme “My top 5 favorite places to write are…”, which really got me thinking! Does where I write have an effect on the type of writing I do? Since I left the corporate world years ago to pursue web copy writing full time, I’ve written in all kinds of environments from a bedroom office to local coffee shops. The people and things around me must have some kind of influence on my work. Being a freelancer, I meet some wonderful people everywhere I happen to connect my trusty Dell laptop to the Internet. I often encounter other freelancers, small business owners and busy Mom’s who are building careers for themselves. These people share fresh ideas and perspectives with me, which are often the inspiration for new material. One would have to say then that the choices of where I love to write have a positive influence on my writing. 1. My queen anne style, vintage cherry writing desk. This desk is the center of my world as a Charleston web copy writer. I picked it up from an estate sale about 6 years ago, from a neiughbor who told me it was his mother’s cherished desk. It has been the place where I have sat many hours late into the night drafting new business articles, worked with clients on marketing plans, and just tried to keep it all together as an entrepreneur. Wherever I go in life, this desk comes along with me and it centers me enough to do my very best. 2. In my bedroom late at night. Sounds like the start of a great romance novel, doesn’t it? Well, to be honest, on days when I am seeking creativity the most, I take my laptop into the bedroom and get under the covers in my jammies to write. I love to write my blog posts there at the end of a busy day. I often write devotionals for my church ladies’ lunch group early in the morning when I wake up, before I roll out of bed to start the day. My bedroom is a safe haven where I ca express myself in any way I wish. 3. My little front porch. What can I say, except I am a real nature girl at heart! Ever since we moved into our dream home last fall, I have made my front porch into a mini oasis away from the stress of a work day. There’s lots of comfortable chairs, green plants and a nice breeze which refreshes my mind. During the times when I get a little burnt out from churning out articles, I relax on my front porch to have some lunch and scribble in my notebook. 4. Local Coffee Shops. Not only do they make great places to spend an afternoon with friends, the coffee shops in my hometown like Starbucks and Bigby Coffee give me a chance to write and collaborate with my clients. I often meet new clients there to go over ideas for web content, or share a quick bite to eat while brainstorming their social media strategy. When my Wi-Fi goes down, coffee shops give me a backup so I don’t lose contact with anyone or miss an important deadline. 5. The beach. Naturally, since I love the outdoors, one of the best places to refresh the soul and do some creative writing happens to be at the beaches here. In the middle of the week, I will sometimes grab my satchel, a pair of sandals, and my trusty notebook to spend an afternoon on the beach. There’s something about the sound of waves splashing against the sand that is so relaxing, and yet inspiring. Late afternoons after all the tourists and crowds have gone are the best time to write on the beach! Well, there you have it…Please feel free to share where your favorite places to write ( or be creative ) are! Today, I am having one of those days when I am trying to squeeze too much into my day trying to be super-writer! Ever go through this as a writer yourself? This feeling often comes from trying to multi-task way too much and not giving enough focus to the tasks at hand. It can also come from biting off too much at once, hoping to rake in the projects and dollars to pay the bills as a freelancer. When this happens, I have to remind myself to take a small step back and seek out inspiration in everyday ordinary things. Let me explain a little more what I mean here…. The world, as we know it, is filled with little bits of inspiration. Like clever quotes found on people’s social media posts, the stories of people who have made their dreams happen, or beautiful images of the natural world right outside your own window. We can see this in the smiles of our children’s faces, or in the love and care we give to others. The key is to take a moment to declutter your brain enough to notice these small snippets of inspiration, if only for a moment. My father once said to me, “take the time to stop and smell the roses”. In fact, I have a bookmark that he gave me the last time I saw him when he was in the hospital fighting his final battle with Leukemia. This wonderful man had worked hard all of his life, rarely taking a vacation or personal time, to support my Mother and younger sisters, and yet he never got to enjoy his retirement years. This poignant phrase has stuck with me for years, and has taken on new meaning as I became a home-based professional. Each day, I try my best to live up to his words by taking five minutes to reflect on what I have learned that day and if I have indeed taken a moment to experience the sweet smell of success. Afterall, without these moments of inspiration – what is life worth living for? Personally, I find that the best inspiration I get is from other creative souls. For example, I love walking in downtown Charleston, SC for the art walks. Those artists and the amazing work they produce inspires me on so many levels. Or the random musicians I find in my daily listens to online radio stations or on reverb nation. Today, I found an incredibly talented musician by the name of “Minds I” (David Isaac Marchant Jr.) whose soulful ambient songs gave my brain a fast infusion of divine inspiration! Other days, I just have to take a short walk outside to be reminded of how lucky I am to work from my comfortable home office daily as a web copy writer in Charleston. Anytime I desire a mental break, all I need to do is step outside and breathe in the fresh air on my front porch. What a feeling of absolute freedom, that inspires me to do my best! So, ask yourself what inspires you? Have you taken the time to smell the roses today? The most common question I get is “how did you get into copy writing?” Just a few years ago, if someone had asked me what I wanted to be “when I grew up”, I would have never considered working at home as a web copy writer! In fact, I had my heart set on working in human resources for a long time, being able to make a positive change in the lives of employees and helping others to develop long-term careers. But, things change as things have a habit of doing, leaving me going through a period of transition as a professional. I found myself exploring various work from home careers and stumbled upon writing as an actual career. It was the best discovery of my life! The ability to work remotely from anywhere with an Internet connection. A flexible schedule that allows project work around other responsibilities. Writing opportunities in every industry and on every topic imaginable. Challenging tasks and projects that never get boring or monotonous. The ability to be as creative as you want to be and enjoy the results of this effort. Ongoing work with a multitude of really cool clients around the world. No worry about noise factors or having to talk on the phone to rude people all day. There are other benefits of having a home based career as a web copy writer, but those just come with the territory! I love the freedom of expressing myself through words. I love working with incredibly talented and smart people daily. I love seeing my name online whenever something is published. Nothing I’ve ever done in my past life as a corporate HR professional has ever compared to the absolute joy I get as a web copy writer in Charleston, South Carolina. So, if you are thinking about taking the leap of faith and writing for a living, I encourage you to explore all the avenues that are available to you in freelance web copy writing! Feel free to leave your questions or comments below – always happy to respond! Buy Me a Laptop – Please! This week, at Taylor Resources Writing, I have been working furiously on some fun projects for existing clients and some brand new clients. Let’s just say that I am grateful for the trust that small businesses and organizations have in me to allow me to write their content, manage their social media campaigns and help them come up with creative ways to get in front of the right kinds of customers. Working from home at my little cherry writing desk along with my trusty Dell Inspiron, a cup of coffee and my cat Pepper to keep me company is something I look forward to on a daily basis. The familiar tapping sounds of my keyboard as I churn out web articles, blog posts and press releases is something I’ve gotten used to and sometimes I think my body and the Dell merge into one, much like a piano player in the rush of a concerto. This laptop has provided many hours of solid work, plenty of reliable service and its cool silver and white case inspires me for some reason. There’s a reason it’s called an Inspiron. However, this little working from home experience is not without its ups and downs. In the past 2 months, I have noticed a marked decrease in the ability of my Dell laptop to keep up with the speed of my brain and the intensity of my wildly typing fingers. It tends to lag on a frequent basis, programs are starting to crash or freeze up, and I have had to take off many files, programs and clear cookies repeatedly to keep it going. 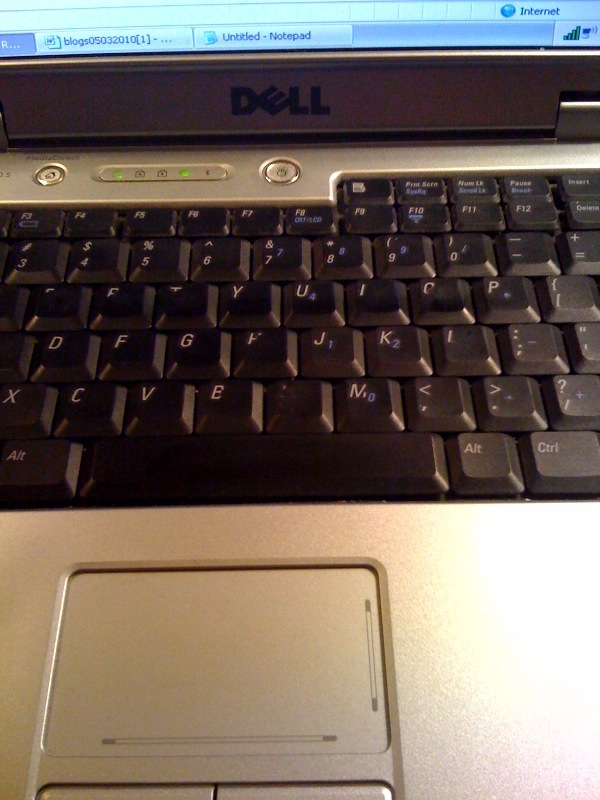 The keys are worn very badly and the wrist rest is missing some paint now, as you can see from the picture. I get those alarming messages that my memory is low – whatever that means??? Every time I download an eBook, upload a photo or review a flash website, I swear I can hear it groan! At first, I thought for sure it was the Internet service so I contacted Comcast on a few occasions and adamantly explained that it couldn’t possibly be my computer as it is top of the line technology and it’s their stupid Wi-Fi that’s the issue – not my precious Dell! I upgraded the mouse and checked the cables in our apartment to make sure they are hooked up right. After meeting with my partner in crime, Dwayne Thompson of Thompson Web Development, who showed me his cool Toshiba Satellite Laptop computer fully loaded with Windows 7 and a bunch of cool software tools, I began to realize that maybe the support tech at Comcast was right when he told me my Dell was “old school”. So, I have come to the sad conclusion that I must retire my Dell Inspiron E1505, with its .99 GB of RAM and the Microsoft XP Home Edition operating system. I hate to admit this, but I did some window shopping, looking at the latest store models in our local office supply stores and low and behold, found something I liked! I saw this gleaming beauty of a laptop at Office Depot, you know the one right next door to Barnes & Nobles (my second home). The sales person raved about it, and after much hesitation I walked over to it, put my hands on the keyboard and I was hooked! And the price – oh my heavens – the machine was only $479 instead of the $629 price tag on the manufacturer’s website. The deal of the century for sure! But, unfortunately, my budget this week is a bit on the scanty side, due to a multitude of writing projects in progress, car repairs to pay for and rent looming on the horizon. My husband gave me that pained look when I mentioned it to him and said “well maybe if you land a new client next month and IF it’s still on sale” and walked away quickly. I stood there embarrassed and screaming inside my head – but I can write it off on my taxes, use it for my business, be much more productive, and provide work faster for my clients! So here is my proposition to all my wonderful clients this week: Buy me a new laptop PLEASE! Help this hard-working freelance web writer to get back up to speed. I don’t want a shiny new Porsche, just a reasonably priced, practical laptop that I can use to do all that writing, brainstorming and researching for you. Yes, YOU! Think of it as an investment in your business and in the success of all that SEO friendly content that I’ve been writing for you. Help a broke small business owner get out of this predicament and get up to the current times with a beautiful, functional Toshiba Satellite Laptop that I saw for a deal at Office Depot. So help a girl out – Help to Buy Me a New Laptop Please!